It adds LTE, moves to a 64-bit octa-core processor with double the RAM (2GB), doubles the storage (16GB) and tacks on a 5MP selfie camera. All in all, Liquid Jade S owners have what it takes to make non-S owners jealous. Let’s start from the beginning. The phone weighs a mere 116g, lighter than almost any other 5″ phone. It’s also quite thin, 7.8mm, which combined with the elongated body makes the phone look narrower than it actually is. This in turn makes the phone feel compact, even though at 143mm tall, it’s actually not that tiny. The 5″ screen is an IPS LCD with good viewing angles and 720p resolution. At nearly 300ppi pixel density, it’s sharp enough for the mid-range, though you might notice some jagginess in text if you look closely. That’s not a problem in our book, but the display is just too dim – we boosted it to 100% and it was still too dark. The display is covered with Gorilla Glass 3, which has beveled sides that mirror the curves on the back. A silvery strip around the sides of the Liquid Jade S give it a sort of Galaxy feel. The Matte plastic has a subtle pattern of diagonal lines that mask fingerprints and dust. One complaint we have is that the Power button is placed in the top-right corner, which makes it hard to reach, even extra hard for lefties. The 13MP camera protrudes quite a bit from the back, which spoils the pleasantly thin look of the phone somewhat. It can record 1080p video at 30fps, the 5MP selfie camera can shoot FullHD videos too. That’s one of the upgrades over the non-S model, which only had a 2MP selfie camera. 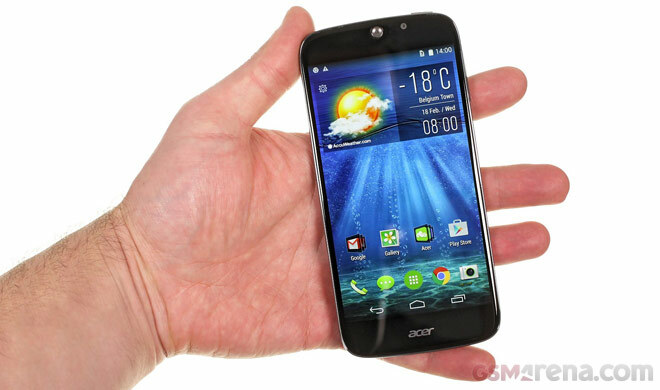 The Acer Liquid Jade S runs Android 4.4 KitKat with some extensive customizations from Acer. To put all those eight cores in use, the software offers floating apps that can run alongside regular apps. You get 16GB of storage out of the box (double what the non-S Jade had) and you can expand it with microSD cards. To do that you need to sacrifice the second SIM slot though. There’s a card tray that can easily be pulled out without any tools (yay! ), which houses two nanoSIMs or one nanoSIM and one microSD. Before we end, a quick word on the box contents – there’s nothing out of the ordinary. You get a one-piece headset, a charger (1.35A) and a microUSB cable. The headset has flat, tangle-free cables, ear plugs and a one-button remote.